I use a Polyscience Sous Vide. Love the product, but, for a scientific company this seems to be an afterthought. They haven’t updated the app in years and now it has stopped working in iOS 11. You can only call them. Most inconvenient. I paid for the Polyscience Sous Vide app (I think $9.99?) and it never got updated to iOS11. So basically I had the app for a couple of months and then nothing. Refund, please. I can’t use my app will you please update? I just bought it. Tried for settings for a freshly thawed 2" ribeye with a starting temperature of 38 F to get to 139. It says it will take over 4 hours, insists this is dangerous and then won't start despite pressing "start". Inaccurate and worthless. So my 15 minutes of trying it has cost me $4.95. Don't make the same mistake. Read more of the reviews. If you cook sous vide ever. User interface is straight out of 1990. Doesn't have the ability to predict cooking times for frozen food. Not worth buying; better options are available. Great way to understand log reduction! Not the same as Sous Vide Dash, but built off the same platform. Measurements down to 9/16". Visually graphed log reductions is something every Chef should see and use. Highly versatile. Would love to see recovery times of larger baths worked into the algorithm. Great app. Imagine great things will come in future updates. So far I have used it half a dozen times, and everything has come out perfect. It's also saved a lot of time documenting my sous vide cooking for the health Dept. Thanks Poly Science! Very limited, can't select a whole chicken !!! Will not recommend. Wow, all the details you might want to know, in one very slick, easy on the eye, and brain, app. Brilliant. App works decently for simple cooking demands but will not calculate cooking times beyond 6 hours. 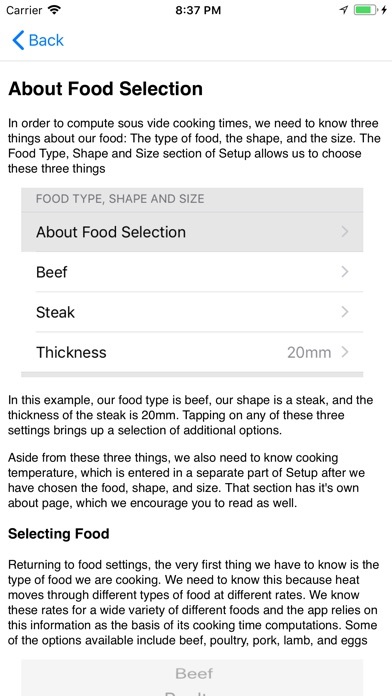 If you want to cook a piece of meat for 30 hours this app will not accommodate your request. Apple warned me this will not work after the next iOS update. I actually do a considerable amount of sous vide cooking from frozen. It lets me keep steaks around without worrying about them going bad. I wish this app allowed a starting temperature into the frozen range handled by most refridgerators. Same as Sous Vide Dash!!! I have Sous Vide Dash. I think I paid a couple bucks for it. Since I own a PolyScience IC, I thought I'd buy their app, just to compare the two. IT'S LITERALLY THE SAME APP. I mean, really? How about a friendly heads-up from the developer, or PolyScience, or Apple, THAT THEY'RE THE EXACT SAME APP UNDER DIFFERENT NAMES? Super lame; waste of $5. Asking for a refund. I bought this to get the cooking temp and time for veal. It wasn't listed, only common cuts of meat which anyone can find on the internet. I read a recommendation for this app so I bought it but it's nothing I was looking for. Any way I can get a refund? I have cooked sous vide for years and never realized how much the time required would be impacted by variations in thickness. With this app I can nail my timing, run "what if" by changing temperature by a degree or two and I have insight to pathogen reduction. The app works great as does my PolyScience immersion circulator. A good start, but limited. For example, you can get estimated times for boneless chicken breast yet not bone in chicken breast. It also doesn't allow for measurements less than an inch which further limits it's effectiveness. Although this application is beautifully written and well presented, there is many missing types of foods that would be helpful to have sous vide cooking information for. For example, this application does not support any vegetables. Also, all of the meat is very generic. For example there is no flank steak. This application would be far more useful if the variety of elements were more expensive. 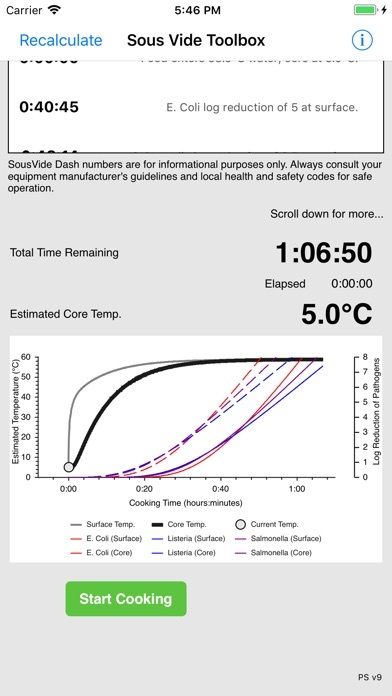 Being a professional chef with a fairly good grasp on the production of sous vide techniques in a busy restaurant I can say that this app is more than efficient for home use but would really love to see a few more features. Such as ... Being able to record and save the data log would be beneficial to completing a HACCP plan. And if Polysciene had a hypodermic probe that could connect through a 30 pin connector on an iPad you could see the actual temp in your protein in real time instead of predicting. 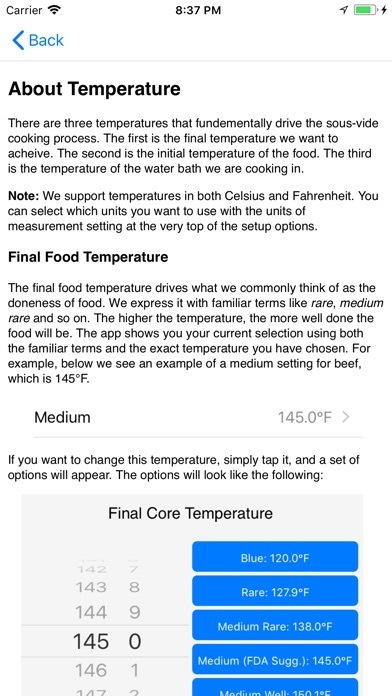 I think over time this app will evolve and be essential to professional sous vide cooking. imagine if you could record all your HACCP plan data through your iPad and not have the fus with the redundant NYCDOH paper work. Great app; clear and concise and kind of a must. Great for helping time almost anything you want to cook sous vide. I wish they would include vegetables in the product selection though. This app is terrible. Horrible interface and doesn't work correctly. total trash. Don't waste your money. Would love to return this app. Totally useless. 1.5 inch steak doesn't take 3 hours at 58c. This app looks great, it has an easy interface and you would think the temperatures and times are very precise. But they aren't. The truth is that all the data in this app doesn't match any data offered by polyscience in their guides that come with the products or the ones on their website. 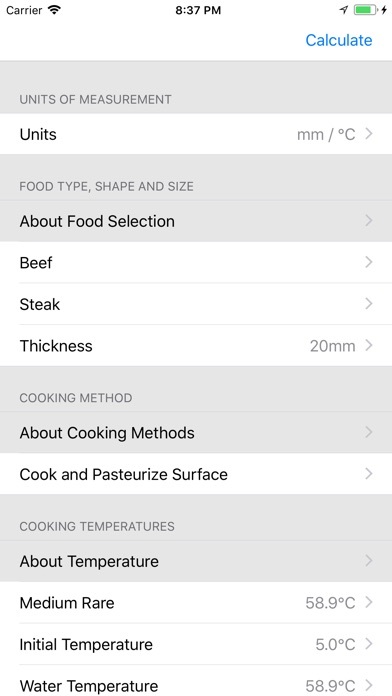 If you are a beginner with these type of products and cooking you will probably be buying this app along with your polyscience immersion circulator, and I'm sure you will be very confused with almost every time and temperature you need to make your first recipes. This app is the exact copy of sousvide dash, they just put the polyscience logo and another developer in the description, maybe thats why all the data has nothing to do with the one offered by polyscience. In addition to all mentioned above the data in this app is not accurate when you compare with other temperature and time tables in several websites and books. Don't buy this app, you will be very confused if you are a beginner and you would be loosing your money. The ap is useful but the temperature limits are frustrating. So if your food is frozen or above the low 70s, you will have to thaw/chill to get it into the aps range. 29 Oct 2017: Won’t run in iOS 11, so nobody should buy this at present. I purchased both Polyscience Sous Vide Toolbox and Sous Vide Dash on the same day thinking they might be different. Anyone who thinks they're not functionally identical is misinformed. The ONLY differences are the colors and the selection of circulators. 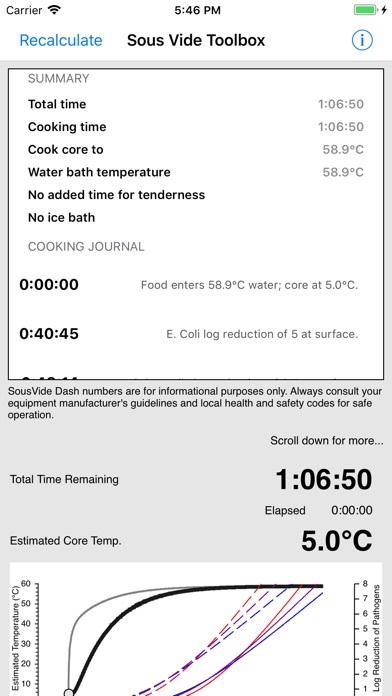 Polyscience Sous Vide Toolbox even refers to itself as "Sous Vide Dash" within the app. PSVT allows you to select from a wider range of Polyscience circulators than SVD and unlike SVD does not allow selection of other brands of equipment (though it does include "Generic Non-circulating" and "Generic Circulating"). This is a useful tool for estimating time-to-temperature for various thicknesses and shapes of food and for estimating reduction in 3 pathogens (E. Coli, Listeria sp., and Salmonella sp.) It's flexible and has fairly reasonable defaults, and includes a fairly wide range of specific foods so you can select lamb loin chops vs. rib chops instead of just going by shape and size. My recommendation is to buy Polyscience Sous Vide Toolbox if you have a Polyscience circulator or like red, or buy Sous Vide Dash if you have a different brand of equipment or like yellow. One or the other is certainly worthwhile if you plan to cook anything sous vide. I use to love this app but it no longer functions after Apple’s latest update. Just got off the phone with Polyscience who said they have no plans to update it. Disappointed you still haven’t updated your app. It’s 2018. Fire whomever is responsible for this area of your business!